Add the water, dried chilies (guajillo and ancho), garlic, peanuts and prunes to a pot. Let this preparation cook for 30 minutes or until the chilies are tender. Add a cup of the water in which you cooked the previous ingredients to a high-performance blender, and put the remaining liquid away. Add the cooked chilies, garlic, peanuts and prunes, and blend until you have a thick paste. If necessary, you may add some more water. Pour this thick paste into another pot and add the peanut butter, the Mexican chocolate cut into chunks, the cinnamon, the chicken bouillon cubes, cumin and salt. Stir with a spoon, add some more water and cook for another 15 minutes until all the ingredients are incorporated and the chocolate has melted. Taste the mole, and if you think it needs salt, add some more. Mole should be thick, so be conservative with the amount of water you add, and stir constantly to keep it from sticking to the bottom of the pot. Place the mahi-mahi fillets in a bowl, add the oil and season with the condiments on the list. Place on a grill to achieve grill marks. Mahi-mahi cooks very quickly; it will be ready when it reaches an internal temperature of 145° F. To serve, add some of the mole sauce to a dinner plate and place the fish fillet over it. Garnish with edible organic calendula flowers and chopped prunes. Mahi-mahi is a white fish that goes very well with sweet flavors, and is a good substitute for traditional chicken. If you have leftover mole, you can store it in an airtight jar in your refrigerator for at least a week. Adriana Martin / Adriana's Best Recipes In my opinion, mole is a magical sauce that includes ingredients as wonderful as chocolate, peanuts and a variety of chilies that give it a unique flavor. 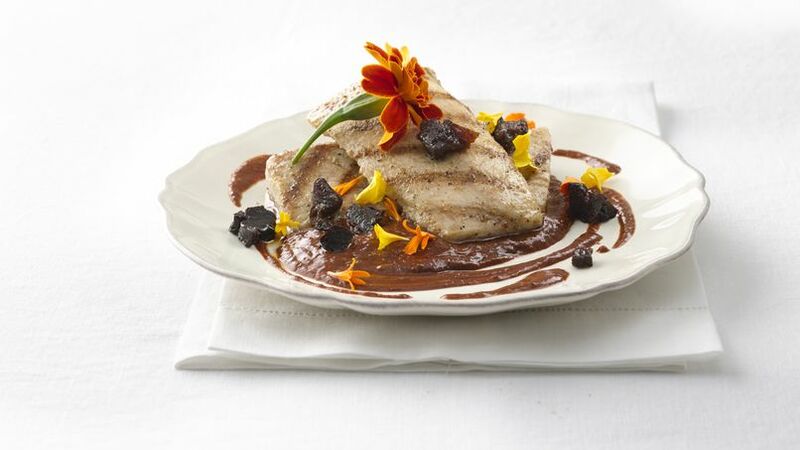 What could be better than mahi-mahi in prune mole sauce, inspired by the original recipe of the nuns of Puebla, whose creativity gave way to this delicious base for Mexican mole!